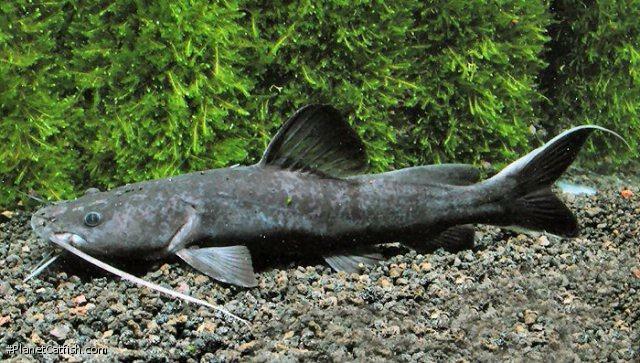 A catfish of character this month, meet Hemibagrus wyckii - the James Bond of catfish. A suave, elegant loner with an interest in gadgets. A fish that will casually destroy most things in its immediate surroundings while remaining entirely endearing to its audience. Tall tales follow this catfish wherever it is kept. My favourite one, heard (sadly not witnessed), first hand was of a British aquarist who kept one of these fish in its own large aquarium. Every now and again the owner would remove the tank hood, put a broom handle in the tank which would instantly be attacked and dragged around the aquarium with the owner holding on (just) to the other end of the wooden pole. Such displays of sheer power can also cause trouble for the fish itself. Other tales include an individual that took it upon itself to crush an aluminium heater guard. Apparently they also enjoy a good chew on rubber heater clips/suckers and I think this would extend to anything in the aquarium that appealed to the catfishes curiosity. Needless to say, smaller tankmates are in immediate peril. Perhaps the best quote of all comes from David Sands in his Catfish of the World series in which he claims, "in the authors experience the only freshwater fish clearly unafraid of man". So how do you keep such a "wicked" aquatic demon? Answer: Alone. And carefully. Keeping this fish is all about planning. It does not require particularly fastidious care or much attention. It is not dangerous unless you are another fish. Once adult, feeding it every week or two and changing the water is about all you need to do. Feeding is a rewarding experience for both fish and keeper alike - the two will get used to each other's ways. But you need to plan ahead to ensure you can achieve this goal. The aquarium needs to be large, this species will grow past 24"/60cm, a minimum would be 30" wide aquarium, the longer the better, 6 foot long tank is probably an absolute minimum. That's a lot of aquarium for one fish, but what a fish! A heavy hood is required as this fish is a good jumper (usually in the pursuit of food) and external heating and filtration are a good idea. External heating because the catfish have a habit of tearing, pulling or chewing heater stats and thus causing much damage - potentially even danger - to the aquarist from faulty, submerged electrics. External filtration because you can maintain it without disturbing the fish, risking a nibble or escape attempt. Why bother with all this effort? Well to my mind this fish is one of the kings of the large catfish. Its velvet black colouration is jazz-club cool, its blue eyes are seductive yet cold and the fins of adults are tipped in an attractive snow white, adding to the impression of understated power. Those blue eyes stare at you, following you around the room with calculating intelligence. If the fish is hungry it will pace around the tank reacting to your presence like a chained guard dog. This is a large, responsive, smart pet fish. Yet the best part is that is possible to keep this species in an ethically sound manner (it doesn't get THAT big) and will grace any large fish room with its brooding persona. Feeding times have never been so much fun. Type Locality Tjitarum R., Parongkalong, Preanger Prov., Java, Indonesia. Etymology From the Greek hemi- meaning half and bagrus, the catfish genus. Identification Members of the genus Hemibagrus are bagrid catfishes that can attain standard lengths of up to 800 mm and are found in large rivers throughout the Indian subcontinent,Southeast and East Asia. Members of this genus have depressed heads,rugose head shields not covered by skin,a slender occipital process and moderately long adipose fins. In life, the crystal blue eye and long, low sloping forehead identify this species which was previously known as Mystus wyckii. Due to the similarity in species name, sometimes this species is mixed up with H. wyckioides (previously known as Mystus nemerus) but H. wyckioides is a more grey colour and has a red tail fin. Sexing Unknown, perhaps females are smaller and fuller. Distribution Southeast Asia: Thailand to Indonesia. Other Parameters Water parameters are not vitally important to this hardy fish. Feeding All types of foods are taken. Young fish can be grown quickly on small meaty foods, but flakes and tablets are also taken. It is best to avoid feeding live fish at an early age - the fish will consume much more as it grows and may become picky about other foods. Larger fish can be fed earthworms, mollusks, prawns, white fish meat and pellets. Experimenting with other foods is recommended. Furniture Inhabits lakes, creeks and rivers in the wild. Large rocks and driftwood if anything at all. These should be firmly secured in place. Heater guards are necessary, if using heater stats. External heating and filtration is a good idea. Large plants will not be eaten but again must be securely in place and of a sturdy nature. Compatibility A lone predator, will attempt to systematically dismantle any living thing too large to be consumed outright. Some report successful combination with much larger fish, but this would require a public aquaria sized aquarium or pond, very risky in anything smaller. Suggested Tankmates None. Try it and you'll end up with one Hemibagrus sooner or later. Breeding Unreported in the home aquarium, probably lays huge numbers of eggs.